We shared on the story of the teacher who drew Microsoft Word on a chalkboard and got Microsoft’s attention. Microsoft’s promised to provide tools through its local partners in Ghana. 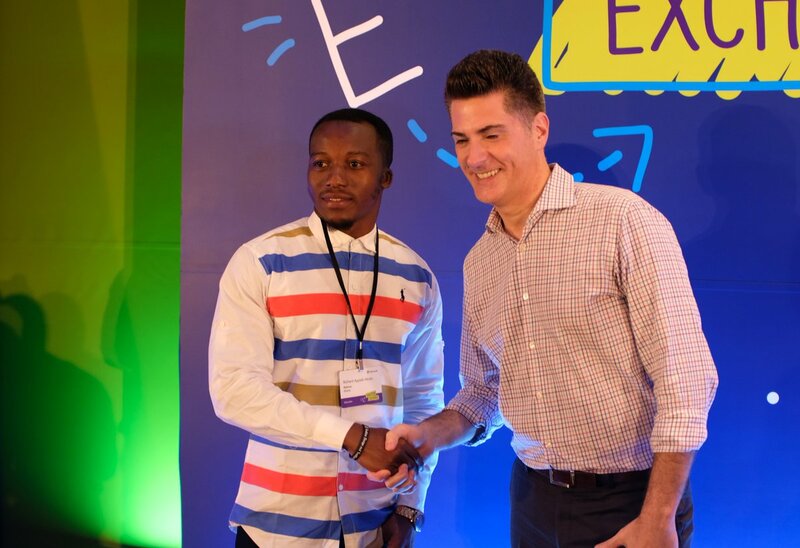 Microsoft then hosted Richard Akoto (Owura Kwadwo Hottish) at its 2018 Global Education Exchange Summit (E2) in Singapore making him a MIE . We also shared a video of Richard speaking at the summit. Below is a press release of the donation made by the Microsoft team and education partner eSolutions Consulting. In a move that is set to further encourage and propel digital transformation on the continent, Microsoft in collaboration with eSolutions Consulting – a local Education partner in Ghana, have today donated technological resources to equip a computer lab at Betenase Junior High School, located in Sekyedumase, Ashanti Region, Ghana. The computer lab donation includes devices for students and lab teacher, furniture – tables and chairs, school uniforms, mathematical sets, device security storage units, 1-year free 3G connectivity, a projector, screen, UPS back up and routers. All devices will also be provided with Office Professional Plus software. We are extremely impressed by the work educators all over the continent are doing. – As economies like Ghana become increasingly digital, technical thinking and understanding technology becomes of supreme importance. Around the world, a key part of Microsoft’s work is concentrated on empowering educators to create environments in and out of the classroom that guide and nurture student passion and enable students to achieve beyond their wildest imagination – making, designing, inventing, building the future” – Warren La Fleur, Education Lead for West East and Central Africa at Microsoft. Teachers not only in Bentase Junior High School but across Ghana will gain access to the Microsoft Certified Educator Program (MCE) for professional development, so that they can nurture their passion for teaching and build rich, custom learning experiences for students. Training such as this is vital in ensuring that educators have the global educator technology literacy competencies needed to provide greater learning experience for students. Working with Microsoft to provide world class solutions to enable Ghana’s education transformation has been a great opportunity for eSolutions Consulting. As a Business and IT Consultancy company set up in Ghana, we aim to help organizations both in public and private sector to improve their performance through the introduction of innovative solutions. Immersive learning, enabled by technology, improves experiences and education outcomes for teachers and learners, as it shifts behavior, motivation and helps to develop an educated workforce with globally applicable skills and knowledge noted Solomon Adiyiah, Chief Operations Officer, eSolutions Consulting. Microsoft has also invested in developing over 300 hours’ worth of free courses, where educators are able to participate in training and receive certification. The duration of each course is between 1 and 3 hours. Focuses vary from how to use tools like OneNote, Sway, and Skype, while others are more instruction based, designed to assist them to integrate technology in their course work. This ties together through assessments and a points-based system and teachers in Ghana and worldwide have access to all these learning tools. The commitment to education will not stop with is donation and certainly goes beyond that of Ghana. Microsoft is in advanced discussions with the Ministry of Education (MoE) in Ghana to sign a Memorandum of Understanding (MoU) on more collaborative ways of transforming education in Ghana. A key objective of this MoU will be to provide support on teacher development and advancing digital literacy in secondary and post.